Sun, Apr 20, 2003 - , , New York, N.Y.
Good evening. I’m Roger Hertog, Chairman of the Manhattan Institute, and it is my honor to introduce Charles H. Brunie, my friend of 40 years. I would like to begin with a story that captures the essence of Chuck Brunie’s character. It was July of 1974, the Brunies, Bronxville yuppies on the rise, had spent a quiet summer evening at home with friends. Suddenly, well after midnight, Chuck simultaneously hears his wife scream from another room and he finds himself face-to-face with two burglars in ski masks. One of them is brandishing a gun. By the way, when Chuck tells this story, he always mentions that the burglars were shorter than he was. He neglects to add that this applies to almost all human beings on the planet. In any event, fearful of Jean’s safety and enraged by the violation of his home, Chuck physically tries to repeal the burglars. In return, the intruder with pistol in hand actually begins to hit Chuck in the face and then, the gun goes off. Now let me stop the action for a moment and tell you what I think most of us, certainly I, would have done at this point and changed my strategy. I would have welcomed my uninvited guests into my home and almost immediately given them my watch, my credit cards, all available cash, provided my PIN number and I might have even had Susan whip up a cappuccino or latte so they shouldn’t have to leave on an empty stomach. But not our boy Chuck. He fought the muggers with his bare fists—not only sending them out the door running, but he actually chased them down the street. They say that character is destiny, and to me this story from 30 years ago exemplifies the passion and the courage that have been at the center of Chuck’s life. Let me tell you what I mean. When I first met Chuck Brunie in 1963, I was an apprentice securities analyst at a small fledgling brokerage firm in lower Manhattan called Oppenheimer and Company. Chuck’s arrival at Oppenheimer was heralded as a grand acquisition, because he had already begun to change the intellectual paradigm of what great Wall Street research should be—quantitative, fact based, but more important using these tools to forecast the future. Chuck understood that great investing required the courage to be bold but it had to be based on intelligent risk taking. The rigor of his example became, and remains, the basis of all successful institutional research. His leadership was a big factor in pushing Oppenheimer & Company through the 60’s and 70’s and early 80’s to become the research powerhouse that was the cornerstone of its success. Oppenheimer had a motto in those days—“think Yiddish, but dress British.” As you can imagine, it was love at first sight for the partners. Chuck was the epitome of sartorial splendor with his perfectly tailored three-piece suits, his striped shirts, and his impeccably folded tie-coordinated handkerchiefs. Even forty years ago his attire and demeanor were that of a gentleman. In a world of huge egos his quiet gentility and his grace countervailed the strident chaos around him. It was these personal and intellectual qualities that Chuck brought to his outside interests. I think it is fair to say that we owe our success at The Manhattan Institute to Chuck Brunie. He was the guiding spirit behind the Institute, except back then that wasn’t even our name. When Chuck first joined the board in the late ‘70’s it was called “The International Center for Policy Studies.” The Board included Lew Lehrman, Irving Kristol, Ed Fuelner, and Bill Casey. The point about changing the name to The Manhattan Institute wasn’t an easy task. Back then, Manhattan had become a synonym for incivility, crime, and urban decay. Many Board members did not want anything to do with the name Manhattan. But Chuck, along with Bill Hammett, had the foresight to envision New York as it could be—and should be. If for that alone, Chuck should be honored. Like all of us, Chuck didn’t create his world view in a vacuum. He credits three thinkers with having a profound influence on his ideas. As a young man, he met the philosopher and writer Ayn Rand, whose belief in capitalism as the progenitor of individual creativity and achievement was to mold his understanding of freedom. In the ‘60’s, he came to know Alan Greenspan who was then managing a small economic-consulting business. But most important has been his friendship with Milton Friedman, whom you heard from earlier this evening. Chuck met Milton in 1968, and he instantly became a Friedmanite. He says innocently, that he and Milton are classic liberals, then he quickly adds, liberal, that is in the 18th century sense of the word, a philosophy grounded in individual, economic, political, and religious freedom for all. It is these ideals, whether in his securities research, investment management or in the world of ideas that are the leitmotif that informs and unifies Chuck’s business and philanthropic life. As those short, puny burglars learned that steamy summer night, watch out, when Chuck Brunie is on the chase. It is for his ideals and achievements that we honor a great New Yorker, Charles H. Brunie. Thank you Roger. You’re a good friend—and even better storyteller. The first thing that came to mind while you were telling everyone of my wrestling an armed burglar in my house, and how you would have made the burglar a very nice cup of coffee and a sandwich if had happened to show up at your house instead of mine, was: thank God for Rudy Guiliani. Roger is right, I do love ideas—and yes, sometimes a good fight. Ideas are my burning passion, the lodestar that has guided me both in business and in philanthropy—and everything in between. And not just any ideas—the free market, Liberal with a capital L variety is my brand. I believe in the transformative power of Free Minds and Free Markets in creating a Win/Win society for all. And for this reason, to be honored by the Manhattan Institute—a think tank dedicated to these ideals which I have watch develop from its infancy to its 25th Birthday—and to be surrounded by so many good friends, and in the company of my fellow trustee, Walter Mintz and the Met’s Philippe de Montebello, and under the banner of Alexander Hamilton, obviously marks a high point in my life. Ayn Rand once said that the greatest contributions to man’s mind are the pyramids and the Manhattan skyline. The difference, she noted was the pyramids were made for the dead, while the skyline of Manhattan was made for the living. On this point, Alexander Hamilton is more the founding father of Gotham’s City’s Skyline than the Dutch merchants. 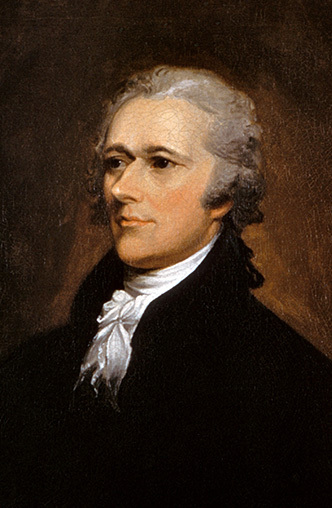 The key historical moment for New York—and indeed for modern capitalism—was when Hamilton conceded to his arch-rival Jefferson that the Capitol would be moved from New York—where it was—to swampland in the District of Columbia. Could you imagine what NewYork would look like if no building could be built taller than the Washington monument? I’m not a person who likes to talk about himself. I’ve very much enjoy being the most “self effacing person” that Devon Cross knows. But after the recent profiles of me in the New York Post—the paper Alexander Hamilton founded—and the new superb paper, the New York Sun—the paper Roger Hertog founded—it seems inappropriate to feign humility. It also should be stated for purposes of full disclosure that I’m a subscriber to the New York Post and an investor and subscriber to the New York Sun. Since, there are many right-minded people in this audience—and lots of money, too—I invite all of you to join in this latter endeavor, which recently enjoyed its first anniversary, and of course, subscribe to both. If you care about the success of ideas and the beliefs you value, its essential to put your money where your minds are. And, of course, even those who don’t agree with “us”—I know that this is a mixed crowd—should see this as an investment in the best research of the opposition. The Sun’s reporter asked me two questions that will frame my remarks. The first was, “how did I get interested in individual freedom, limited government, laisez-faire capitalism? I told you this is a smart paper. The second was: how come the Manhattan Institute? My answer to the first question was that my mind was opened when I read Ayn Rand’s Fountainhead when I was in my late 20’s. Prior to that I was the classic Northeastern Eagle Scout who thought, “If only we had good people in government…” This book was not on the reading list of my alma mater, Amherst. After this I devoured Atlas Shrugged and subsequently attended Miss Rand’s weekly lecture series at the New School (TK) for a couple of years. And you thought only lefty’s came from the New School. It was at these lectures that I met Alan Greenspan, Miss Rand’s economic expert. Boy, did I learn from him—since then to this day. Another crucial encounter came in 1968, when I met Milton Friedman during a bear market (which I defy anyone to find on a LT chart). My friend Fred Stein, who’s here tonight—called Milton into Oppenheimer as an advisor. (One could afford to do this before Milton won the Noble Prize.) Fred and I were worried that the bear market was a sign that the U.S. was sliding into a Depression like that of the 1930’s. Graciously Milton said, “You’re so wrong.” He argued that politicians want more than anything else to avoid the last big mistake. Thus, whenever economic weakness surfaces—as it always does and always will—politicians will over stimulate the economy to avoid a repeat of the 1930’s—the nest result being: a Rising Roller-Coaster of inflation”—and not depression. Milton convinced me, but unfortunately I couldn’t convince my partners at Oppenheimer of the wisdom of his forecast. Fred has always been more persuasive. I’m a Liberal of the Milton Friedman variety, because capital L Liberalism offers a rational way to view the word, and its validity is demonstrable in that its ideas are capable—unlike Marxism for example—to make good on its promises. Its forecasts are real. If one’s life-plan is to “hunt in the morning, fish in the afternoon, and read and write poetry at night”—the Marxian vision of the Communist Promised Land—then capitalism, the rule of law, and limited government are the best means to achieve this retirement dream. Plain and simple, next question. As for how I came to the Manhattan Institute, I met Antony Fisher in the Taiwan airport in 1978 on the way to a meeting of the Mont Pelerin Society—an organization founded by the Noble Prize winning author of The Road to Serfdom, Frederick Von Hayek. It turned out that Anthony, a former RAF-Battle-of-Britain pilot, had, after the war, made it good in business, and had read an abbreviated version the Hayeck’s book in the Readers Digest. His interest sparked, he sought out Hayek, and asked him how a newly minted rich man could prevent his country and western civilization from going any further down the statist road the Austrian economist had famously described. At the time, Fisher thought going into politics was the answer. Hayek answer: “If you want to do something more for your country, DON’T go into politics, since politicians always lag behind public opinion. And public opinion always lags behind the tide of intellectual thought. So try to change elite intellectual opinion. Which, he added, is a 20-30 year process. Buying into the idea, Anthony left the chicken business where he had made his fortune and went into the think tank business—where he changed history. Within a decade, he had seeded 30 think tanks 20 nations around the world—a 150 think tanks to date. As I mentioned, I had met Anthony Fisher in 1978 in Tiawan. This was shortly after he and Bill Casey, one of Wild Bill Donovan’s key people in the OSS in WWII—had founded the Manhattan Institute—the third installment in this free-market franchise. It should be noted that his first venture the Social Market Foundation (TK) developed Margaret Thatcher as candidate and Thaterism as governing philosophy. The abbreviated version the story is that upon return from Taiwan I immediately joined this effort, becoming chairman shortly thereafter in 1980—as Anthony moved on to the next venture and Bill Casey joined Reagan Administration—and with a couple of Manhattan Institute books like Wealth and Poverty and Losing Ground, helped fuel the Reagan Revolution. I asked that the Manhattan Institute provide everyone here with a copy of Tom Wolfe’s recent account of the Manhattan Institute’s impact on the policy debate over the past 25 years. Read this article and you see why I support the Manhattan Institute—and why you should do the same. Since it first opened its doors, the Institute has seeded those intellectual realignments that precede and are the stuff of political change. Supply-side Economics; Guiliani-style policing; Tort Reform, Compassionate Conservatism are few highlights Institute’s contribution to New York City and America. My direct role in the success in this enterprise has been limited: I provided the Institute with money. I gave generously, asked broadly, and did not mettle in the day to day picking of talent and issues. The true secret of the Manhattan Institute’s success has been its ability to attract and market the best talent in the public policy business—men and women, whose thinking can cut through the cant—offering clear visions and policies for change. Thinkers like George Gilder, Charles Murray, Peter Huber, Wally Olson, George Kelling, Heather Mac Donald and Myron Magnet—just to name a few—don’t grow on trees. But they do seem to be cultivated at the Manhattan Institute. Over the past two decades, I have had the pleasure of watching two of the best intellectual stock pickers and marketers of ideas in the think tank business, Bill Hammett—who put the Manhattan Institute on the map—and Larry Mone, who continues to prove that the Institute’s best days lie ahead. All in all, I’ve been very proud to be a part of what Bea Himmelfarb told me “is the most influential think-tank in America.” And I look forward to our Board Meeting later this month when I get to see what is in the promising R& D stages at the Institute. For the bottom of my heart, thank you all. Thank you, Don, for those kind words. I am very grateful to my fellow trustees for honoring me and I thank the members of this audience for coming here and for being so generous in purchasing tables and tickets. And, special thanks are due to Roger Hertog, our President, Larry Mone, our Vice President, David DesRosiers, our staff and my fellow trustee and former partner, Rick Reiss, for doing so much to organize these festivities and persuading so many of you to participate. Quite a few of my friends who regard themselves as liberals chose to come here tonight because I am being honored. This pleases me very much. But I was less pleased when some of these friends told me that they are quite uncomfortable about coming to an event sponsored by a conservative organization—even though in most cases they know little or nothing about what the Institute actually does. One friend who did buy a table said she did not want to come to this dinner because, in a athering of conservatives, she would not have anybody to talk to. Now I don’t mean to scold my liberal friends. On the contrary, the fact that they know so little about Manhattan Institute is largely my fault because I neglected to tell them much about us. So, I want to emphasize that we are not a bunch of knee-jerk ideologues hewing to some rigid dogma. Putting simplistic labels on people or organizations is often convenient but sometimes conceals more than it reveals. For example, as many of you know, I have been a trustee of Reed College for many years and served as Chairman of the Reed Board for a while. Over the years, I have been asked dozens of times why a conservative like me would support a college with the reputation of being very left wing. It is true that the student body at Reed is about as leftist as any student body in the country and I don’t think there are many Republicans among the faculty. Yet, by today’s standards, Reed’s academic program is extraordinarily conservative in many respects. The students carry an enormous work load; there are lots of old-fashioned course requirements and every freshman is required to study the works of Dead White Males who lived in ancient Greece. And here is another example of the confusion sometimes created by political labeling: The Manhattan Institute is widely believed to be a very conservative organization. But a number of its trustees voted for Clinton and Gore and have contributed to Democratic Party campaign funds. Not long ago, we hired a brilliant young scholar named John McWorther, an African American who holds some very politically incorrect opinions about a variety of matters having to do with race relations. Yet he told a magazine interviewer that, and I quote, “In terms of a great many other issues, I am a very leftist person” and, by the way, he voted for Ralph Nader. At the first of these Hamilton dinners two years ago, one of our two honorees was Senator Patrick Moynihan. During his long and brilliant career, Moynihan often took positions which offended many liberals and, at least for a time, he was regarded as a leader of the so-called neo-conservative movement. But, in dealing with some issues such as Clinton’s welfare reform bill and government spending policy, he was a very liberal Democrat. Now, I am not trying to suggest that we are closet liberals. Most of us do believe that societies which allow free markets to function are more likely to produce liberty and economic growth than other kinds of societies. We are skeptical about what has been called political correctness, not because we want to be unorthodox, but because those who are politically correct so often are wrong about the facts or simply ignore the facts. And this brings me to the main point I wish to make tonight. It is true that some of the arguments advanced by the Manhattan Institute involve assertions about values and about morality and about what constitutes justice. However, most of the issues we have addressed turn on facts not ideology. For example, we have long believed that our inadequate public schools would be substantially improved if they were forced to relinquish their monopoly powers and if parents had a variety of choices in deciding which schools and what sorts of schools their children would attend. School choice has long been seen as a conservative idea, but the validity of the argument for school choice turns on the question of whether competition among schools will in fact improve the quality of education. There’s a growing body of empirical evidence—some of it produced by the Manhattan Institute—that school choice does just that, and that competition or even just the threat of competition helps to create better schools. So, if you want to prove that our emphasis on choice is misplaced, you must show—as some have tried to do—that those who advocate school choice have used bad data or inappropriate statistical methods. Where you stand on this issue should not depend on whether you think of yourself as a liberal or as a conservative but on your assessment of the available facts. There are good reasons for believing that welfare reform has significantly helped a great many poor people even when the effects of the 1990’s boom are taken into account. Strict enforcement of laws governing minor crimes is likely to reduce the number of major crimes. rent controls and the enormous amount of red tape that builders face when they try to get their projects approved. Regulatory reform would make housing more plentiful and more affordable for most citizens including most poor citizens. If the municipal bus lines in New York City were offered to private companies on the basis of competitive bidding for franchises, City government could save hundreds of millions of dollars. When other cities in Europe and the U.S. privatized their bus routes, substantial savings resulted. In 1991, our Senior Fellow, Peter Huber, published a book about what he called, “Junk Science in the Courtroom”. Huber demonstrated that American courts often based their decisions on what purported to be good science but was, in fact, nonsense. Thanks to subsequent decisions by the Supreme Court, which cited Huber’s work, this problem has now become less acute. helped to bring about the present budget crises and how these crises could be alleviated. The press and many politicians have cited lots of statistics to show that racial profiling by the police has been pervasive, but these statistics are highly misleading and greatly exaggerate the true extent of the racial profiling problem. And the foregoing is just a small sample of the kind of work we do. In the past several years, there have appeared a number of newspaper and magazine articles about the growing influence of so-called conservative think tanks, including the Manhattan Institute, and about the possible reasons for our success. The really curious thing about these articles is that most of them never even consider the possibility that we are as successful and influential as we are because we have gotten the facts right a lot more often than our critics have. I said at the beginning of this speech that I was very grateful to my fellow trustees for honoring me. One reason I am so grateful is that I now have had the chance to talk to a large and distinguished audience about some topics that matter to me, such as the confusion which is often created by political labeling, the harmful but widespread tendency to discuss issues of fact as if they were ideological issues, and certain misapprehensions about Manhattan Institute and Reed College. I don’t know whether I have persuaded you that I am correct about these matters but, frankly, the mere attempt to persuade you has given me some satisfaction. In any case, I thank you very much for listening. Well you almost got to go home early. Frank, thank you very much for your au revoir [phonetic], for addressing me so very warmly. I will forgive even the [unintelligible] comment about Texas. I could never have said such a thing. And I hope you all understand that you have just been shown a landscape that is all peaks and has no valleys. I am I guess rather grateful that not too many of those valleys were cited. I am grateful as well to Roger Hertzog [phonetic] along with the trustees asking me and bestowing upon me the honor of the Alexander Hamilton Award this evening. I asked Roger who had, through my secretary, indicated that I should speak 10 to 15 minutes. You mean 10 to 15 minutes? He said no, I mean 10 and not one minute more. So I will take my cue from shifting in the seats when I sense that we get to that point. He asked me also to speak about the issue that you heard a bit from Frank Richardson [phonetic] it is of standards, excellence, and quality; and frankly the battle because it is to a certain extent today a battle to achieve them. It would have been very tempting to speak to you today about the aftermath of 9/11, the state of the Museum at the moment. I would like to think that this is a short term situation and of little and anecdotal interest. There is no question we have been struck by a confluence of several scourges in the last few years from the declining economy, the vertiginous [phonetic] drop in the stock market, the state of the city which happens to be in better times a more prodigal friend of the Metropolitan and other cultural institutions. And then of course 9/11 followed by all of the terrorist threats and now the SARS which mean . . . I know in this audience you are not immediately thinking of the suspicious activity reports. That would not have had the same effect on the Met. So into words, yes of course these are extremely painful and difficult times with revenues dropping almost as fast as expenses are rising, with the concomitant through the roof rise of insurance and security costs. I want to talk about something that is a bit more long term and a bit deeper which is really the issue of the creeping market forces onto institutions that ought to be core driven, that to a large degree in the art museum world still are. But I think there is no question that without invoking Jeremiah too literally, that the sanctuary is about to be assaulted. Why should it be deemed so serious that art museums would be threatened, let’s say by market forces? And the answer is very simple. The answer lies in what it is that we are which is repositories for works of art. And I do not think to this audience I need to dot too many I’s and T’s reminding that works of art are not just pretty pictures or pretty objects. Works of art a an important manifestation of the creative spirit. They embody and express with graphic force and intensity the highest aspirations of a time and place and as such in the aggregate they do provide direct primary evidence about humankind and by extension about ourselves. That makes them in the end essential markers in charting the growth of civilization. And if you are charged to be the trustees for posterity of such works, that is a serious matter. And the increasing trend to want to make of art museums a fun place is simply ill advised. How did we come to this stage? We came to it essentially in the last thirty years, and I do bring almost that entire span of time of perspective on this, as a result of the clarion call for arch democratic forces in the late 1960s. And museums had weathered this rather well. They have indeed broadened in enormously being much more diverse, much more open and accessible; but in the process they created their own bubble. If you look at museums, art museums especially across the country, all of them have had huge expansion projects. And just looking at my own house in the last twenty-five years we have doubled from a million to two million square feet. The number of curatorial staff has gone from about 55 to 110 today. We have grown in every sector, but I think more significant than this is the administrative staff did not double, it multiplied b five in that span of time, and the budget multiplied by ten. I think that it is fair to say when you come on a weekend, especially let’s say when Leonardo and Monet, the last [unintelligible] are on at the same time that the words of my predecessor or one of my predecessors not directly, Francis Henry Taylor in the 1940s was quite apt but may not have gone far enough. He described using Coolidge [phonetic] the Metropolitan as a stately pleasure dome. And I think on those weekends, I think if he had gone just a little bit further in the poem, he would have perhaps called it a cavern majalis [phonetic] to man. But with all of this size came what you all know which is the need to maintain the Institution, the need to raise a great deal more money, and dependency very much on the gate. And when you depend on the gate, you arrive at the necessity to enlarge and increase the number of events, of exhibitions; and you become, by definition, a hyperactive institution. People increasingly wanting to visit the Institution when something special happens and you have got to make special things happen more and more frequently. I know that there are people who when we furled in our, unfurled our banners on the façade think of it as the glow of health. I generally tell my trustees that it really is the flush of fever. Increasingly with the attention and many, many more staff members focused and whose primary preoccupation is with the public rather than directly with the work of art. Just look at an annual report and count the number of staff who deal with the public rather than pure research in the academic side of the house. We have, and I want to stress that this is a matter of emphasis and not pitting obviously public versus work of art. We are there to serve the public. That therein lies an interesting paradox which is that when the work of art ceases to have primacy of place, and all of your attention is devoted to the public, the public is less well served. And the reason for this is that you then tend to cater to the public, and catering to the public means pandering to the public, means offering, even spoon feeding programs, exhibitions that are increasingly of a predictably populous sort which therefore tends to be not terribly challenging intellectually and pulls the rug from under what is the primary mission of the Institution which is to broaden ones appetite. And so blockbuster from blockbuster has created variations on theme with generally the same artists and movements represented because most people tend to want and seek the things that they already know. As Frank has mentioned and I think someone else earlier this evening, this tendency towards bringing pop culture into institutions such as art museums has the virtue of increasing the crowds on a short term basis perhaps. But I think it will attract the fickle public that will come once for a quick fix and not the loyal visitor that will return frequently. And it brings to mind all of these rather razzle dazzle kind of exhibitions and events. Hamlet is chiding the actors for their histrionics on stage though they make the unskillful laugh cannot but make the judicious grieve. In addition to that wide program, I think one finds also increasingly in art museums today again as part of this desperate catering to larger and larger audiences because it builds upon it. You enlarge your staff to deal with larger audiences and you understand the whole principle and the vicious circle that this brings and that is that we also enlarge the whole area of amenities. Amenities are wonderful. I like benches in galleries, I have a bad back and I love to sit. But you read and you see a number of museums created today. Oh I don’t think I will identify one, but a major building in the mid-west was created for an art museum that doubled the size of museums. The new building doesn’t have a single space for art. It is all restaurants, it is all party spaces and things of that sort. Then Turi [phonetic], the Philadelphia architect who built the Seattle Museum, was fond of saying he wanted it downtown. He wanted it immediately on the street because he wanted to replicate all of the aspects of daily life. He wanted to demystify the museum experience. It strikes me the when you climb the stairs on 82nd and Fifth that the last thing that you want is to have the din of the street follow you in the galleries, and I presume you look for a little bit of serenity. Now I don’t want to seem overly querulous or too much like a Cassandra. There are wonderful things of course still in our art museums. Hope is not all lost. In fact we have great curators. Art is still absolutely beautifully installed, and marvelous exhibitions are mounted; but there is no question with this tremendous pressure to generate revenue comes the great danger of jeopardizing ones standards. And my message, my message to my trustees, my message to myself, to my staff, to everyone which is not one of Volks Clamonte Tindizerto [phonetic]. There are many, who think in that way and who struggle in fact to try to maintain standards is that really the way to do it is, and there is the first principle is an electable [phonetic] and it is that you have absolutely to raise endowments because only when you have got . . . I m not doing that tonight. But that is only a reprieve. Now the point of having a large endowment is that it simply makes sense that if you are not going to cave in under a lot of external pressures to generate revenue. And if you are going to have total integrity in programming, you have got to have a good endowment providing the ability for the institution to have integrity in the sense of independent judgment not inflected by fashion and politics and how the programs are brought. Of having authority, not in the sense of other authoritarianism but authority in the sense of absolute scholarship so that the public can depend and rely on the institution to set the standards and ultimately, of course, authenticity which is what all of you seek in a museum and any form of simulacrum [phonetic] has to be entirely banned.